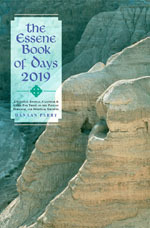 The Essene Book of Days is a seasonal journal calendar and guide for those on a path of personal and spiritual growth. 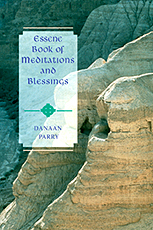 Danaan Parry had a deep interest in the spiritual approach of the Essenes. To use this book as your personal journal is to call upon the wisdom of the Essenes as revealed in the Dead Sea Scrolls in the service of your own spiritual development. This unique book allows you to dissolve the barriers to your own spiritual awareness gently as you reconnect with the rhythms of the natural order. Updated each year, the Essene Book of Days shows solar and lunar cycles; provides a page for each day of the year to record your own thoughts; and is filled with Parry's meditations and blessings based upon the teaching of the Essenes. 416 pp. $19.95 Danaan Parry. (ISBN 978-1986668200). "Danaan Parry—a true pioneer. His ideas and techniques help all of us who care about our earth and are willing to act." "Danaan Parry shows us a path beyond peace - toward participation in the creation, together, of a vital, healthy, loving world. A song of celebration for this work and for his life." "To me, Danaan Parry lives on as an inspiring teacher of the power that one man has to bring about planetary healing. He was a true warrior of the heart." Alan Cohen, author of The Dragon Doesn't Live Here Anymore. Essene Book of Meditations and Blessings is a handy pocket-size book featuring all the daily meditations and blessings found in Essene Book of Days. A great travel companion! 144 pp. Danaan Parry. Price: $8.95, including Shipping and Handling. $7 each for five or more to the same address. 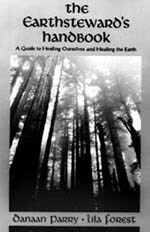 EARTHSTEWARDS HANDBOOK: Currently out-of-print, this volume is a collection of reflections and practical suggestions on ways to help make the spiritual vision of the Sevenfold Path of Peace a reality in our life together on this planet. Book orders and all publishing matters are handled by Publishing toll-free at 1-800-561-2909 or by email at publishing@earthstewards.org. All profits from the sale of these books help support projects of the Earthstewards Network. Shipping and Handling for U.S. Addresses: U.S. address is any address within the 50 United States and U.S. Possessions and Territories. No charge for USPS Media Mail within the US. We charge for shipping by USPS Priority Mail, and to addresses outside the US. The shipping charge is the difference between Media Mail postage and the actual cost for the shipping. Within continental U.S., allow 7-10 days for delivery. Media Mail to Alaska, Hawaii, APO addresses, and other addresses outside the continental U.S. can take several weeks to arrive. The USPS has raised rates the last several years, so we cannot predict the additional cost if we ship other than Media Mail. In 2016, the additional charge for Priority Mail within the US was $3.70. Email publishing@earthstewards.org or call us at 800-561-2909 to get the actual shipping charge for Priority Mail. Sales Tax We collect sales tax only in Washington. Please include the rate for the address to which the book is being shipped. Amazon.ca now carries our Essene Book of Days and Warriors of the Heart, and several European Amazons also have these books. You should be able to save substantially on shipping costs if you buy on these sites. Shipping outside the US is now Actual Shipping cost, no handling charge. *Actual Shipping Cost Shipping cost is based on weight and destination. Varies by Country. Outside the US, we can ship directly from the printer instead of USPS, to save you money. We have no way to predict how long it will take to deliver your book(s), however. Email or call us to get the Actual Shipping Cost. If you are ordering several books, we often do not know until we package them exactly what the shipping cost will be. Working with Danaan and reading Warriors of the Heart shaped my approach to conflict resolution. In particular, these experiences deepened my appreciation that conflict resolution begins within and is as much about building relationship as it is about solving problems. 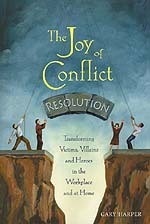 The Joy of Conflict Resolution explores these aspects of conflict through the lens of the �drama triangle� of victims, villains and heroes. It is accessible, engaging and light-hearted in style and uses stories and humor to explore potentially emotionally charged situations. I believe the book will be of particular value to Earthstewards who encounter conflict in their roles as positive change agents in the world. Author Gary Harper was a member of the initial PeaceTrees Vietnam in 1996.